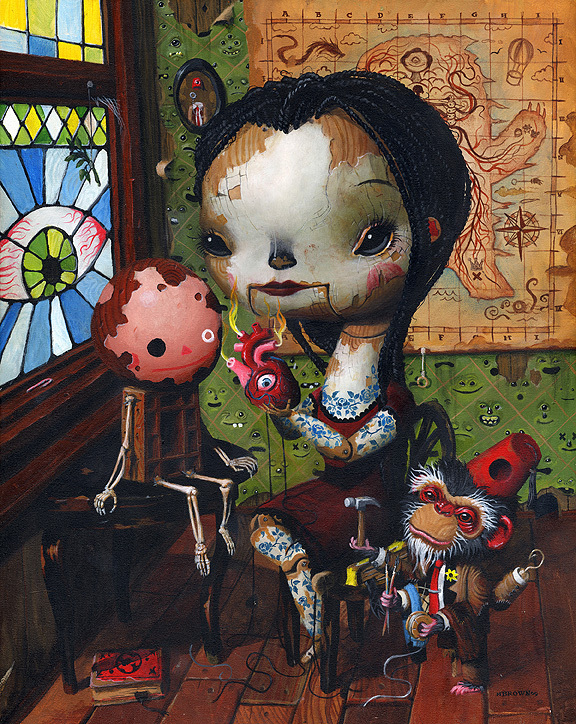 As we previously covered, Mark Brown’s debut solo The Lost MacGuffin opened up at Gallery 1988 LA with much anticipation and it lived up to the hype. Luckily AM caught up with the busy artist after the opening for his first ever interview to discuss MacGuffin, his artistic style/influences, G.I. JOE characters fighting R2-D2 and of course The Beastmaster. Arrested Motion (AM): This show was your first ever solo exhibition. Any solo-jitters? Mark Brown (MB): No time for jitters. Had to paint. AM: The title of your show is called “The Lost MacGuffin.” What the heck is a MacGuffin? MB: Do you like Hitchcock? Everybody likes Hitchcock. Well, this isn’t really anything like Hitchcock. Except the “MacGuffin” part. A MacGuffin is a plot device. Sort of an overall motivator behind all the action. In this show, the MacGuffin is a book, coincidentally named “MacGuffin’s Encyclopedia.” When I was a kid, I read way too much. I would hop on my bike and ride into town to go to the library. My favorite books were encyclopedias. I read the Encyclopedia Britannica cover to cover when I was seven. My favorites though, were the children’s science encyclopedias. I would take notes on tree forts, rafts, or whatever I found that looked cool, then I would ride back home and build stuff. I felt like it was all secret knowledge that only I knew was there. I also have the gift of an insanely short memory, so I can read the same book every year and it’s all new to me. I usually forget what a book was about before the movie comes out. So I’ll probably forget what a MacGuffin is as soon as the show’s over. AM: We’ve seen a wide range of characters you’ve painted, from Garbage Pail Kids to Snake Eyes to Legos and even Strawberry Shortcake. It seems that you’re heavily influenced by the pop culture of the 1980’s. Did television help to develop your vivid artistic imagination? MB: Absolutely. Hey nice catch on the Snake Eyes! Snake Eyes was my favorite. One day me and my friends had toy Armageddon day and only Snake Eyes and R2-D2 survived. Did you know that if you shoot a GI JOE guy with a BB Gun in just the right spot, it snaps the rubber band holding him together and the arms and legs fly clear across the yard? Well, now you know. And knowing is half the battle. Snake Eyes made it because I couldn’t bring myself to blow him up, and R2-D2 survived because he was indestructible. I watched everything, so it all mixes together in my head. I would follow a Doctor Who marathon with Outer Limits, then Mutual of Omaha and Disney. 321 contact was a big one. I would even run from the bus to catch Dark Shadows which was pretty stinkin’ lame, but it had vampires. If it was on TV, I watched it. My favorites were the Muppet Show, Twilight Zone and anything stop motion or claymation. I was really into Voltron and Robotech. I had a Thundar the Barbarian lunchbox. I wonder sometimes if a whole generation of Americans was brainwashed by Showtime and HBO. It seams like Beast Master was always on at least one cable channel. I bet I’ve seen it over a hundred times. AM: Many of your paintings give viewers a feeling of constant movement, whether its levitation, flight or just a simple sprint – there always seem to be something in motion. Any plans to go the opposite way and create still life subjects? MB: I’m really enjoying the movement thing at the moment. Next, I’m hoping to get more interaction between characters, then I’m thinking about how to crop an image to zoom in and focus even more on the action. Still-lifes are pretty far down the list of things I’d like to try, but now that you mention it, it’ll get stuck in my head. Hmmm, maybe a still life of something that just happened, and the viewer has to figure out what it was. Great, thanks a lot, now I’ll spend a ton of time thinking about still-lifes. 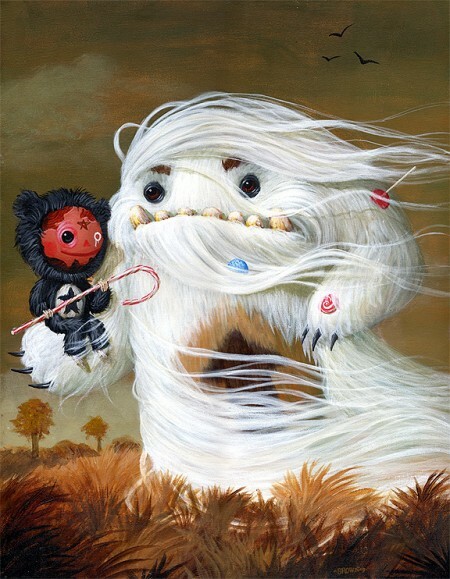 AM: Your artwork tends to include a few recurring characters, like the Luchador, Abominable Snowman, the Devil, etc. In addition your pieces seem to also contain a mysterious numerology. Do you care to share what they symbolize or do they play different roles depending on the piece/show? MB: And monkeys. Don’t forget the monkeys. These guys are like a holy trinity. What’s a trinity with four instead of three? A Quantity? Probably a Quantity. They make any painting better. I challenge anybody to name a painting that wouldn’t be improved with a monkey. Hey that’s a great Idea for a painting. The Holy Quantity. I think I’d do it like a Hindu painting rather than a christian painting, just because old Hindu paintings are way cooler in my opinion. 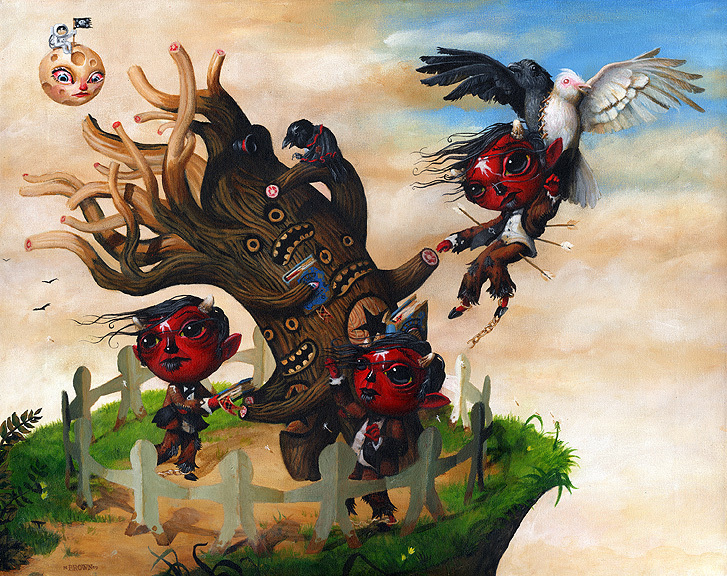 The numbers symbolize all sorts of things, varying from painting to painting. Sometimes it’s to explain a sequence, or to personalize a character by associating the number’s connotations, other times they can be track numbers of songs, stuff like that. Some times, I’m not really sure why it’s there, I just know it needs to be. AM: Your colorful, illustrative compositions and use of lively characters littered amongst intriguing backdrops often draws comparisons to a young Mark Ryden or Todd Schorr. Can you tell us a few of your artistic influences? 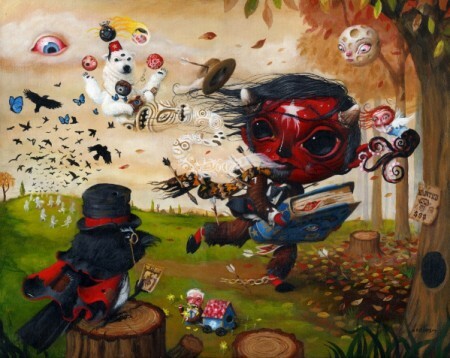 MB: It’s pretty amazing and inspiring to be compared to two of the seminal voices in pop surrealism. I think that as more of my work comes out and my characters and world evolve, that people will see how my stuff is heading in its own direction and the stories I’m telling have their own voice. 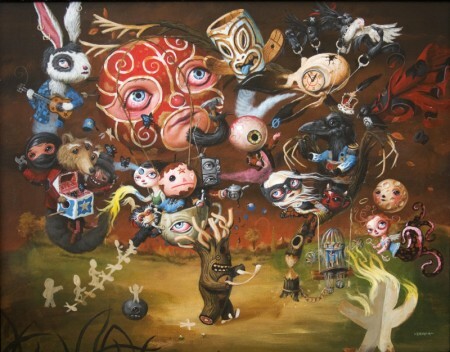 I think that growing up and living in the rural Northwest, I wasn’t exposed to many styles of art, and the only things that made it up here were the big name artists on album covers and later in magazines, so as far as this genre goes, Ryden and Schorr were all I was exposed to. It all fit in with other influences like view master slides, encyclopedia illustrations, children’s books, retro advertising, all that stuff. I also remember that I really liked the softer look of forest service botanical posters of different kinds of trees and leaves. I always wanted there to be more stuff in the illustrations I saw in kid’s books. I was always drawing in them and adding things like extra heads and arms. I put in thought balloons that turn into more characters. I was always trying to figure out how to tell more of a story with a single image. There were also a lot of movies. From Bergman and Fellini to Burton, Gilliam and Jeunet. Lately I’ve been looking at old Hindu paintings and a lot of animation backgrounds from Disney and Hanna Barbara. 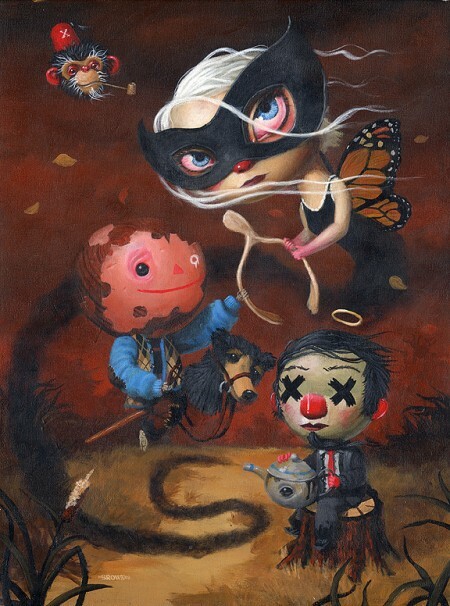 I’d also say that newer artists like Joe Sorren, Mark Bodnar, Nicoletta Ceccoli, have had an effect on me. Scott Campbell and Dan Goodsell are consistently amazing me. There’s way too many influences to remember, let alone list. AM: What are your plans for the rest of the year? Any projects or shows you would like to share with us? MB: There’s a lot of great commissions that I had to put on hold while getting everything together for this show. So I’m super excited to get back to those, and I’ll be putting all my time into them. There may be a painting here and there for a group show or two at Gallery 1988 if there’s time, but I’m going to be pretty much focused on commissions this year. AM: Thanks Mark for taking the time to interview with us. 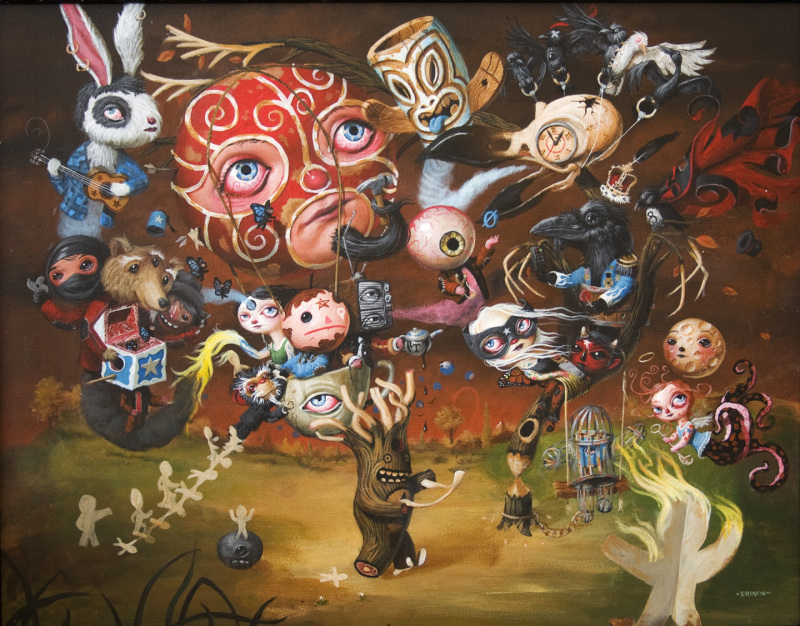 Categories: Art, Features, Interviews, Low Brow & Pop Surrealism. 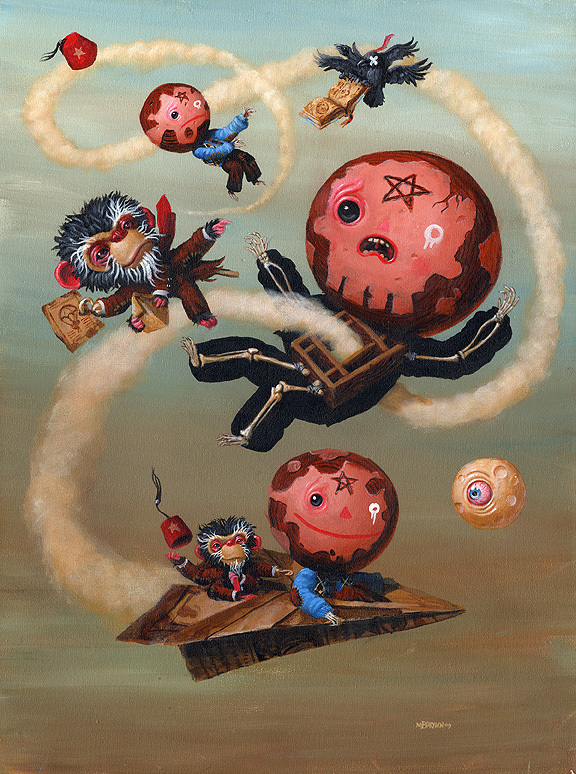 Tags: Gallery 1988 LA, Interviews, Low Brow & Pop Surrealism, Mark Brown.